Neurofibroma is an uncommon benign tumor of the oral cavity derived from the cells that constitute the nerve sheath. See the images below. 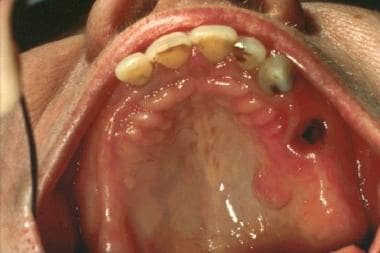 Multiple neurofibromas on the tongue. An 11-year-old girl with an asymptomatic raised lesion on the anterior mandibular gingiva. Solitary neurofibroma on the hard palate. Oral cavity involvement by a solitary and peripheral plexiform neurofibroma in patients with no other signs of neurofibromatosis is uncommon. Sporadic cases have been reported in the submandibular gland, tongue, and on the periosteum at the mental foramen. This sporadic syndromic occurrence has also been seen in the cutaneous region, and several authors have suggested that these isolated neurofibromas may represent a hamartomatous growth. The World Health Organization (WHO) has subdivided neurofibromas into 2 broad categories: dermal and plexiform. Dermal neurofibromas arise from a single peripheral nerve, while plexiform neurofibromas are associated with multiple nerve bundles. Other clinicopathologic subtypes include localized neurofibroma (sporadic neurofibroma), diffuse neurofibroma, plexiform neurofibroma, and epithelioid neurofibroma. Plexiform neurofibroma arises along peripheral nerves and tends to involve the smaller branches of the nerves, producing a poorly circumscribed and locally invasive tumor. Approximately 21% of patients with NF-I present with plexiform neurofibromas. These lesions can result in substantial morbidity, mainly due to their size and ability to cause disfigurement. Plexiform neurofibromas are considered to be pathognomonic of for NF-1. These lesions produce the classic "bag-of-worms" appearance. Occasionally, malignant transformation of plexiform neurofibroma is reported (< 5%). This tumor is better designated as a malignant peripheral nerve sheath tumor (MPNST), which tends to exhibit a poor prognosis compared with nonsyndromic MPNSTs. An uncommon variant of neurofibroma is the diffuse neurofibroma, which typically involves the skin and subcutaneous tissues, resulting in enlargement of affected tissues. Diffuse neurofibromas are most often seen in the head and neck region and may involve the oral cavity. [7, 8] These lesions are more common in adolescents or young adults. Malignant transformation of diffuse neurofibromas is rare, and rapid growth and careful microscopic examination of the biopsy sample is essential to rule out such a change. A minority of diffuse neurofibromas (< 10%) are seen in the setting of NF-1. Intrabony presentation of neurofibroma. Note the extensive bone destruction caused by the lesion. The cell of origin for neurofibroma has not been definitively identified. Some believe it arises from the Schwann cell. Perineural fibroblasts are neuroectodermal tissue cells that synthesize collagen and create a network that envelops the individual axis cylinders of the nerves with their associated Schwann cells. Some investigators believe that perineural fibroblasts give rise to the neurofibroma. The cause of these lesions is unknown; however, neurofibromatosis syndrome or the disseminated form is inherited as an autosomal dominant trait and may present with a variety of lesions, including a highly variable number of neurofibromas. Little information is available regarding the relative frequency of solitary oral neurofibromas and oral manifestations of neurofibromatosis. A survey of series on oral neurofibromas has reported that approximately 20-60% of cases are associated with neurofibromatosis. Intraoral neurofibromas may be seen in as many as 25% of patients with neurofibromatosis. Another review of head and neck neurofibromas reported that approximately 25% of all neurofibromas are seen in the head and neck region and 6.5% occur in the oral cavity as solitary or multiple lesions associated with NF-1. Although these lesions may be seen anywhere in the oral cavity, the most common location of this tumor is the tongue. They have also been described on the gingiva, palate, major salivary glands, and maxillary bones. No racial predilection is recognized for oral neurofibromas. No sexual predilection has been described for oral neurofibromas. Solitary neurofibromas have a good prognosis, with only rare instances of local recurrence after excision. However, in neurofibromatosis, a larger proportion of patients develop recurrence after excision, and multiple recurrences are associated with malignant transformation. Spontaneous malignant transformation of 1 or more lesions is also reported. The rate of transformation is estimated to be 5-15%. This neurofibrosarcomatous change has an extremely poor prognosis, and distant metastasis is common. The average 5-year survival rate is dismal and ranges around 10-15%. A study involving 66 cases of head and neck neurofibromas reported that no recurrence of the neurofibromas was detected after surgical removal in approximately 33% of the patients during follow-up ranging from 3-230 months. Angiero F, Ferrante F, Ottonello A, Maltagliati A, Crippa R. Neurofibromas of the Oral Cavity: Clinical Aspects, Treatment, and Outcome. Photomed Laser Surg. 2016 Feb. 34 (2):56-60. [Medline]. Depprich R, Singh DD, Reinecke P, Kübler NR, Handschel J. Solitary submucous neurofibroma of the mandible: review of the literature and report of a rare case. Head Face Med. Nov/2009. 13;5:24.:24. [Medline]. [Full Text]. Anastasaki C, Dahiya S, Gutmann DH. KIR2DL5 mutation and loss underlies sporadic dermal neurofibroma pathogenesis and growth. Oncotarget. 2017 Jul 18. 8 (29):47574-47585. [Medline]. [Full Text]. Marocchio LS, Oliveira DT, Pereira MC, Soares CT, Fleury RN. Sporadic and multiple neurofibromas in the head and neck region: a retrospective study of 33 years. Clin Oral Investig. 2007 Jun. 11(2):165-9. [Medline]. Johann AC, Caldeira PC, Souto GR, Freitas JB, Mesquita RA. Extra-osseous solitary hard palate neurofibroma. Braz J Otorhinolaryngol. 2008 Mar-Apr. 74(2):317. [Medline]. Karaosmanoglu B, Kocaefe ÇY, Söylemezoğlu F, Anlar B, Varan A, Vargel İ, et al. Heightened CXCR4 and CXCL12 expression in NF1-associated neurofibromas. Childs Nerv Syst. 2018 Feb 17. [Medline]. Shimoyama T, Kato T, Nasu D, Kaneko T, Horie N, Ide F. Solitary neurofibroma of the oral mucosa: a previously undescribed variant of neurofibroma. J Oral Sci. 2002 Mar. 44(1):59-63. [Medline]. Vivek N, Manikandhan R, James PC, Rajeev R. Solitary intraosseous neurofibroma of mandible. Indian J Dent Res. 2006 Jul-Sep. 17(3):135-8. [Medline]. De Raedt T, Maertens O, Chmara M, et al. Somatic loss of wild type NF1 allele in neurofibromas: Comparison of NF1 microdeletion and non-microdeletion patients. Genes Chromosomes Cancer. 2006 Oct. 45(10):893-904. [Medline]. Gomez-Oliveira G, Fernandez-Alba Luengo J. Martin-Sastre R, Patino-Seijas B, Lopez-Cedrun-Cembranos JL. Plexiform neurofibroma of the cheek mucosa. A case report. Med oral. May-Jul 2004. 9:263-7. [Medline]. [Full Text]. 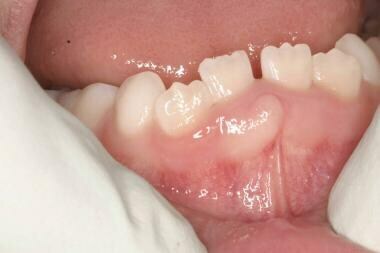 Isolated palatal lesion in a 27-year-old African American woman.